After the turkey and stuffing are put away on Thanksgiving night, bring your out-of-town guests to Historic Downtown Clarksville for family entertainment sure to get everyone in the holiday spirit. 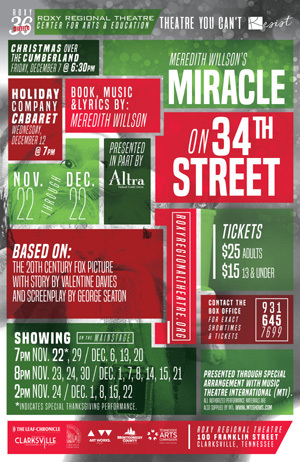 Altra Federal Credit Union proudly presents Meredith Willson’s MIRACLE ON 34TH STREET at the Roxy Regional Theatre, opening Thursday, November 22, at 7:00pm. In keeping with the theatre’s traditional pay-what-you-can opening night, all tickets not pre-sold at the regular ticket price will go on sale at 6:30pm that evening for a $5 minimum donation. Adapted into a musical by the creator of THE MUSIC MAN, Meredith Willson’s MIRACLE ON 34TH STREET follows Kris Kringle as he takes on the cynics in this beloved holiday classic. Single mother Doris Walker doesn’t want her six-year-old Susan’s head filled with romantic notions. When their neighbor, Fred Gaily, tries to woo Doris by charming Susan and taking her to see Santa Claus at Macy’s, where Doris works, Doris is not impressed. But when it turns out that Macy’s Santa may, in fact, be the real Kris Kringle, a wave of love spreads across New York City that melts even the most cynical hearts. Starring Mia Bergstrom as Doris Walker, Stephen Shore as Fred Gaily, Brian Best as Kris Kringle and Ellie Thomas as Susan Walker, MIRACLE ON 34TH STREET also features Demi Ahlert, Ian Alexander Erbe, Sebastian Fenton, Emily Goad, David Graham, Rhyen Kretz, Robert Murray, Rachel Musson, Rachel Sherman, Mikquala Skelton and Kyle Smith, with piano accompaniment and music direction by Matthew McNeill. On Friday, December 7, patrons are invited to ring in the season at the eighth annual “Christmas Over The Cumberland” at F&M Bank’s Franklin Room, featuring a holiday dinner, festivities and meet-and-greet with the cast. The evening’s menu includes all the holiday favorites: turkey and dressing, ham, sweet potato casserole, green beans, rolls, salad and assorted holiday desserts. Doors open at 6:00pm, with dinner served at 6:30pm, followed by the 8:00pm performance of MIRACLE ON 34TH STREET at the Roxy Regional Theatre. Tickets are $40, including the show. Reservation deadline is November 30. Directed by Ryan Bowie, MIRACLE ON 34TH STREET is based on the 20th Century Fox picture, with story by Valentine Davies and screenplay by George Seaton, and is presented by special arrangement with Music Theatre International (MTI). In addition to Altra Federal Credit Union, funding support for MIRACLE ON 34TH STREET has been provided by Kay & Randall Haase, Randy & Su Whetsell, John & Cathy Stanton, Barbara & Larry Goolsby, James G. Holleman, Dr. Ben & Erin Webber and Elite Primary Care. Performances run November 22 through December 22 on Thursdays at 7:00pm, Fridays at 8:00pm and Saturdays at 2:00pm and 8:00pm. There is no 8:00pm performance on Saturday, December 22. Tickets are $25 (adults) and $15 (ages 13 and under) and may be reserved online via the below button, by phone at (931) 645-7699, or at the theatre during regular box office hours (9:00am to 2:00pm, Monday through Friday, and one hour prior to curtain). APSU students, military and CitySaver coupon holders can receive two tickets for the price of one to Thursday performances during the run.